Last year I started an outdoor project to convert my neighbour’s old garden gazebo to a new garden shed. Except for adding the trim, this project is finished. There was a lot of steps in project and a lot more work than I expected, but it was a lot of fun and as usual I learned a lot. I was planning on posting an article of building the shed, so I took a lot of pictures during the project, which was great when I create the book. To say thanks to my neighbour and have a keepsake of the project for myself, I decided to make a photo book of the project. I heard about Blurb from a friend and I decided to use their service to make a book. The steps I followed to build the shed are also important for making the book, as you will see from the rest of my post below. I didn’t want to spend a lot of time learning a new tool and I do not have Adobe InDesign, so I decided I to use their Bookify process. Also, I was in a hurry in to make and order my book 🙂 Overall, I liked this online process, but for my next book I will probably try BookSmart. This is because BookSmart has a lot more page layout options available and at times I felt a bit restricted and what I could do. It is a good idea to review all of your photos that you want to use for your book and put them all in one location on your computer. This will make it a lot easier when you are creating your photo book online. If necessary crop and enhance your photos with photo editing software, I used Photoshop Elements, but you may not want to do this step. This section will deal strictly with making a book using the Blurb Bookify system. You can create a lot of different styles of books. 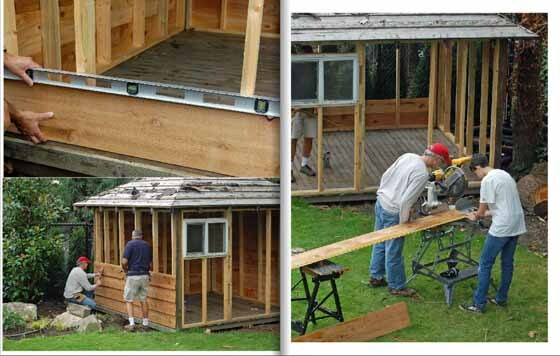 Since I wanted to stay close to the process I used for building my garden shed, I decided to go with a sequential format. Organize the photos in your book and repeat steps 9 and 10 to add all of your photos to the book. These are all the steps to get started with making your photo book. In the future I will write an article with more details on using the software and formatting your book. Plan to take a few days to design your book. It’s fun, but it can be a lot of work to design your first book. Stick with it and you will have a beautiful book that will tell your story. I watched this video after I created my first book and I wish that I watched it first. It is almost an hour long and if you have the time I recommend you watch it before starting your book. Get a copy of all of your photos in one location and print them out on a contact sheet. Cut the photos out and lay them out on a large area so you can review all of your photos and organize your book. When choosing the format of your book, do you have more horizontal or vertical photos? Usually go with the format that has the highest percentage of photos. The format of the book is if you have a landscape or portrait orientated book. When choosing the size of your book, if it is a promotional book and you do not want to spend a lot of money go with the soft cover and 8×10 or 7×7. If it will be a coffee table book then bigger is better. A spread in your book is two open pages. The most used spreads are: photo on left and right page, photo across the gutter, photo on the right page only. Put multiple photos on one page if there is a strong relation between the photos. I’m already starting to plan my next photo book and I’m think of a 7×7 book on different garden arbors in neighbourhood. If you have any tips or questions on making a photo book, please leave a comment below.